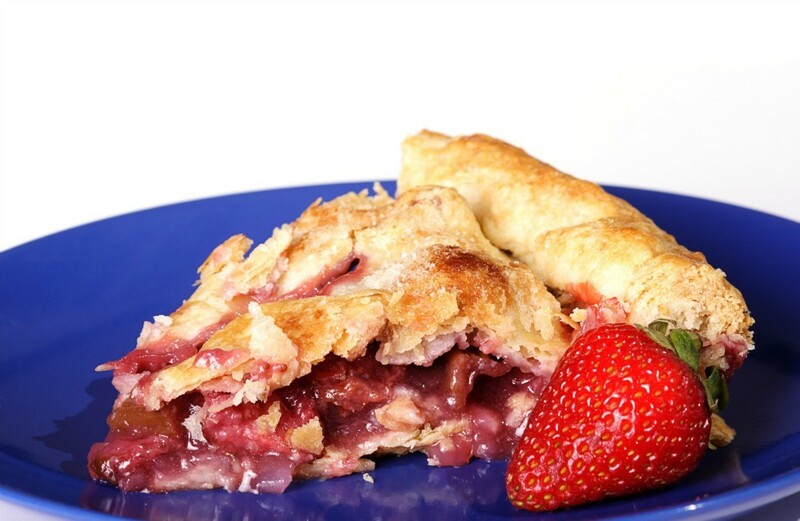 When we think of rhubarb, pie comes to mind, but it can be used in many other recipes. This page contains recipes using rhubarb. Another good rhubarb recipe! Stir together in given order: brown sugar, oil, egg, buttermilk, salt, soda, vanilla, flour, rhubarb and nuts. This is a simple way to make rhubarb and everyone loves it. I took it on a fishing trip and had to give the recipe to everyone. It is a good way to make something different with rhubarb. My grandson would eat the whole thing if I let him. You can eat it warm or cold, on pancakes, ice cream, whatever you can think of. We like it with French vanilla coffee creamer. my grandson's favorite way. Source: Found it on line while searching for rhubarb recipes. To the 4 cups of water add 1/2 cup tapioca. Boil and stir often to prevent burning, until thick. Add the 4 to 5 cups rhubarb, cook until soft. Add sugar or sweetener to taste. Stir until dissolved and serve warm or cold. In a saucepan, combine sugar, rhubarb and orange juice, and bring to a boil. Reduce heat;. Cover and simmer for 6-8 minutes or until rhubarb is tender. Cool slightly. Pour into a blender container; cover and blend until smooth. Chill. Just before serving, fold rhubarb mixture into whipped topping until lightly streaked. In 6 chilled parfait glasses, alternate layers of cream mixture and strawberries. Top with strawberries and a sprig of mint, if desired. Makes 6 servings. Rhubarb - you either love it or not. There doesn't seem to be any in-between when it comes to this fruit that lends itself from a pale pink to a ruby red hue. This strange looking plant with its giant leaves and pink stems comes originally to us from China and Tibet. These ancient cultures used the rhubarb for medicinal purposes. Its leaves are very toxic, and they should never be eaten. Here are a few country-fair recipes for rhubarb - pick your favorite and see if your family can decide if they are rhubarb enthusiasts. Mix the sugar, flour, milk and egg yolks together. Pour this mixture over the cut rhubarb and mix together well. Pour into an unbaked pie shell and bake in a 425 degree oven until the fruit is tender and the filling is a custard consistency. You can add meringue to the baked pie using the egg whites and 3 tbs. of sugar. Brown in the oven for about 10 mins. Heat oven to 350. Using a pre-buttered baking pan, place diced rhubarb in pan and sprinkle with 1 cup of the sugar and all of the cinnamon. Heat in oven for about 20 mins. Remove from oven and set aside. Cream together 2 tbs. butter and 1 cup sugar. Add the eggs, gently stir in the flour, and add the salt. Mix gently incorporating all the ingredients. Pour this mixture over the hot rhubarb. Bake in oven for 1 hour. Remove, cool, and cut into squares. Mix the flour, powdered sugar and butter together and press into the bottom of an ungreased 7-1/2 x 11-inch pan. Bake at 350 degrees for 15 mins. Remove from oven and set aside. Mix the rhubarb, eggs, sugar, flour, orange juice and salt together. Pour onto the baked crust. Bake at 350 degrees for 30 mins. Using a knife inserted in center, check to see if the center is set. If not, bake for an additional 5-8 mins. Test again, and when knife comes out clean, remove, cool, and serve. Here is a very different kind of jam. Try it - you just might make this your favorite! In pan, combine all the ingredients above. Simmer over a gentle, low heat until well cooked. Pour into fancy glass jars. When the jam has cooled, cover with plastic wrap and store in your refrigerator. There is nothing nicer than combining two seasonal favorites and discovering that two good things make one great pie! Combine the rhubarb, strawberries, sugar, flour, butter and milk. Gently blend and then pour into unbaked pie shell. Dot mixture with remaining 1 tbs. butter. Cover pie with additional pie crust, or use strips of pie crust for a lattice design. Also, if using an additional pie crust, combine equal amounts of flour (about 1/2 cup), sugar (about 1/2 cup), and about 3 tbs. softened sweet-cream butter. Cut with pastry blender or two knives. You will get very tasty crunchies to sprinkle on top of your pie crust. Flute the edges of the two crusts together before using the sprinkles. Bake in a 450 degree oven for 10 mins. Reduce oven to 350 and bake for 30 mins. or until crust/or crunchies are lightly browned. erve with vanilla ice cream for a very special pie ala mode. Hope these recipes make a rhubarb lover out of you and your family. Crush graham crackers, add sugar and melted margarine (reserve 1/2 cup.) Pat remainder in 9x13 inch pan, bake 10 minutes at 350 degrees F. Cook rhubarb, sugar and cornstarch until rhubarb is done. Recipe for Rhubarb Dumplings. Mix all ingredients. Divide into 12 balls. Roll each one into a 4-5 inch circle. In the center place approximately 1/4 cup rhubarb. I'd like to know about other uses of rhubarb, so far I can only use to cook with strawberry and sugar to eat. Is there some recipe with salt for good use of my rhubarb plants ? ADDED NOTES: This chunky sauce is good with chicken, pork or duck.  Heat fat in large frying pan over medium heat. Add onion, apple and rhubarb. Cook for a couple of minutes, stirring occasionally.  Add red wine, sugar and spices. Bring to a boil, reduce heat and simmer uncovered, stirring occasionally, until rhubarb is tend but you can still see individual pieces. Add salt and pepper to taste. MAKES:12 (6 OZ/175 mL) SERVINGS COMMENTS:Made several times over summer and is very tasty. I have also frozen the concentrate successfully and added pop after thawing just before seerving. Also good with just water as a mix. Excellant way to use up a lot of rhubarb. Note: All starred ingredients may have to be purchased to make this recipe.  In medium saucepan, combine diced rhubarb, sugar and water.  Stir to blend and cook over medium heat until fruit is very soft, about 15 minutes.  Remove from heat; press through a sieve.  Add to fruit juices. Cover and chill.  TO SERVE: Pour 1/2 c/125 mL rhubarb concentrate over ice cubes in tall glass, fill with ginger ale, and stir. Try sparkling mineral water or lemon-lime pop too. **IF USING SWEETENER INSTEAD OF SUGAR: Cook rhubarb and water; sieve, add fruit juices and sweetener after the mixture has cooled to room temperature. Hi, I have millions of recipes and wouldn't know where to start, but I have a great cookbook I bought while on vacation 2 years ago called "The Joy of Rhubarb by Theresa Millang" Check Half.com, I have bought more through there for gifts. Loads of recipes....you will love it. I use it alot. Rhubarb Pie or stewed Rhubarb, it's all good. The way I fix it is easy, not like my moms from scratch. I take pie pastry in a box. Peel and chop up the rhubarb put it in the pie shell heaping high add 1/4 cup sugar then put lid on put 2 slits bake at 350 till brown sprinkle sugar on top serve with ice cream or custard. For the stewed you just peel and chop it put in a pan with 1/4 sugar and simmer till cooked serve the same way with ice cream or custard. Check out this recipe - it's pork with a rhubarb chutney. Easy to replace the pork with chicken and not change anything for a great meal. Here is a link to a bunch of rhubarb recipes. When using Rhubarb in recipe, is there any special preparation to the rhubarb (ie: put it in blender prior to putting it in recipe)? Depending on the recipe of course, you wash the rhubarb, take off the ends, then you cut into about 1 inch chunks add a tiny amount of water, don't let it swim, say 1 Tbsp. per pound. Bring to a slow boil with a lid on and simmer until soft, maybe 5 or 6 minutes, could be less check often! It breaks right down, you then use it in your recipe or just have it with cream or custard!.. I always add sugar right at the beginning, it's soooo tart. Hope this helps. Lisa, I didn't know you needed to cook it before you use it in a recipe! I just dice it and mix it up for a pie. Maybe you only pre-cook if you're making custard? The recipe directions will let you know what to do to it before using. Sometimes you sprinkle with sugar and let sit for a bit other times you just wash, dice and use. The larger the stalk the tougher it is so if you are picking it yourself, pick some nice young stalks that are reddish pink. Just don't eat the leaves, they are poisonous. I LOVE rhubarb in cookies, pies and jams! YUM! For that great recipe for rhubarb , pineapple & jello jam, after peeling the rhubarb I cut it into approx 2" pcs then with the pineapple put it all in the food processor. It turned out really good, I don't like chunks of fruit in jam. by the way I would like to thank the one who sent in the recipe for the "jello jam" it is SO easy! I made 4 batches already - would have made more but that is all my rhubarb patch would yield! By the way I prefer it with 2 & 1/2 C of sugar instead of 3.
called Stewed Rhubarb. Loved it still warm! I have a similar question. How much of the stalk can you cut/chop up? All of it or just the red part? This is a guide about ginger and orange rhubarb. 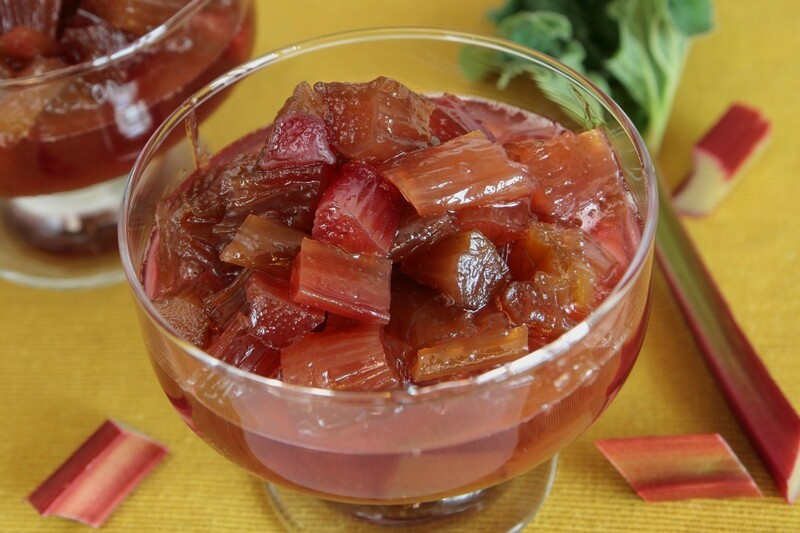 Try this delicious way to prepare rhubarb.